Last night I dragged one of my Apple IIs up from the basement and set it up, and searched through every disk I own, searching for a game that only I remember. It was a version of the old text-based Star Trek games that randomly printed out page-long quotes from Marcus Aurelius' Meditations. Unfortunately, I only have about half of the disks I had from that era -- I don't know what happened to my "main" box of disks. Probably, I brought it to college with me and lost it during some move. I love playing "Ask the Game Geek" for other people, so it's somewhat driving me crazy that I can't find this one. I found lots of other interesting things that I had forgotten about -- frankly, I'm surprised that so many of those 5 1/4" floppies still worked. "There's a standard type of noncommercial, amateur-produced "Star Trek" game that has existed for nearly every computer, from mainframes on down. Typically it is played in a grid of sectors, where each grid itself is composed of a subgrid. The Enterprise might be represented by an "E", klingons by "K", etc. You play by entering commands to the Enterprise -- for example, "T" and then a number 1-8 to indicate a direction to fire photon torpedos, "M" to move with warp drive, "I" with impulse, etc. The implementation details of these games all vary, but they're instantly recognizable when you see them. In the early 1980's, I played a particular version of this game on the Apple II computer. The odd thing about it was that at random times, for no apparent reason, it would spew out long quotations from Marcus Aurelius "Meditations". I mean, long quotes -- we're talking a full screen of confusing philosophical text -- "And it is this which makes us ask what the difference is between the representation of a thing and the thing itself, which is to say a thing in itself, yadda yadda yadda" (I just made that quote up completely to give you an idea -- it's not a literal quote from the game/meditations). (1) Identify this game, naming the precise game name or executable name, and author, and if possible publisher or distribution channel). The identification must be sufficient to distinguish it from the hundreds of other versions of this game -- "The game is called 'Star Trek'" is not an adequate answer. (2) Alternatively, point me to a disk image containing the game. Again, I want to emphasize that I already know there are many versions of this game that don't emit obscure Marcus Aurelius quotes. I have most of them. I'm only interested in the one described here." It probably doesn't help matters that most of these games have completely generic names -- "Apple Trek" "Star Trek." The most distinctive name of the bunch is "Stellar Trek" by Rainbow Computing and Tom Burlew. I played it for a while, but was not Marcus Aurelianized. Someone else has apparently approached this problem from the other end, and is trying to collect a massive database of all Star Trek games ever made. Unfortunately, I can tell just by glancing at their list of Apple II games that it's incomplete. It's amazing, though, seeing how many versions of what I think of as the "mainframe Star Trek" game. There's even an Atari 2600 version! Now that's one I need in my collection. Which leaves us with the last remaining question: why? Why do I care about this at all? Surely, each time I think about something like this I am losing another skirmish in the ongoing war against nostalgia. My only explanation is that the Aurelius-quoting aspect of the game was so strange, so completely a non-sequitur, that it has at times left me wondering if it really happened. More than anything, I want to know the story behind this game. Who created it? Why Aurelius? Why those quotes? Where is the author today? I want to know. If there are any games that you think only you remember, ask me in the comments, below. It would be nice to be able to solve someone else's mystery, since I've reached the frustration limit on solving my own. Here are some links to some of the resources mentioned in this article. I'm not the only person to have been interested in the history of the original mainframe Star Trek game and to have been disappointed by what they found. Here's the most detailed listing of early versions that I've been able to find. With source code for almost 20 versions! The large list of Star Trek games. Not comprehensive, but a good start. The most reliable mirror of the Asimov Apple II archive. Most games are in the "images" directory, although you can also grovel around in "unsorted" if you want. If you're using a Mac and want to play any of these games, you'll want Emulation.net's Apple ][ page. For Mac-based beginners, I'd say you want Gerard Putter's Virtual ][. If you're on Windows, the sine qua non has always been, and remains, AppleWin. Can't help you with yours, I'm sorry to say. Perhaps you can help me with mine? 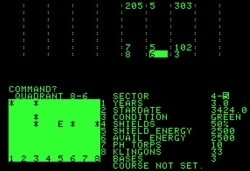 It was an Apple ][ edutainment game for one or two players where you would enter in mathematical equations. The equation would be drawn on the screen, and you'd be trying to hit certain random targets and miss others. You could get pretty tricky- my favorite trick was to add a sin(Nx) function to simpler function, say a line equation, causing a nice "wiggle" above and below, clearing swathes of targets in one go. But the game was smart and would limit how long your line could be. Two player was "hotseat". It was amazing how helpful a fun game can be in learning graph functions. I was toying with the idea of taking their basic idea and writing my own, souped up version for the Mac. I'd really like to know what the old one was called though. That's an ordering site. I'm leaving the rest as an exercise for the reader. You're amazing! Thanks! And I see there was an Apple ][ version by the same makers, so this could very well be the exact same game. I wasn't able to find an Apple ][ Disk image of "Green Globs and Graphing Equations." However, a number of university libraries have it in their collection, as do some high schools. So if you have the right affiliations, you may at least be able to borrow it from someone.